A funeral for Peaches Geldof — who died earlier this month at the age of 25 — was held today in Kent, England, at the same church in which she was married two years ago, which is also the same location of her mother's funeral in 2000. 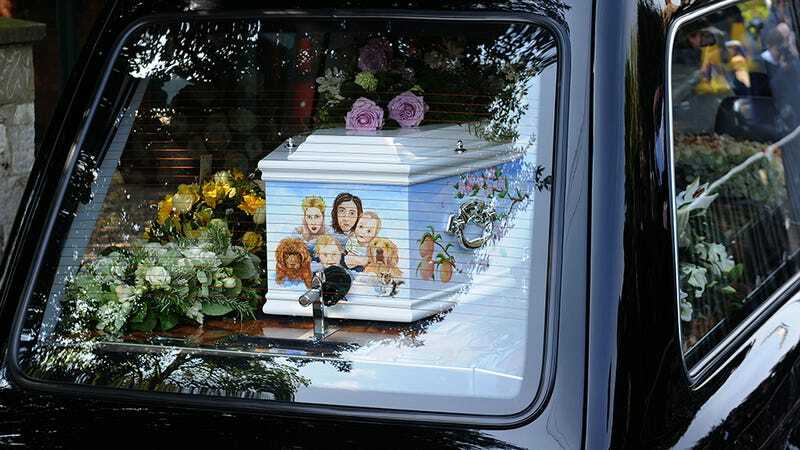 A hearse carrying her sky blue coffin drew into the estate shortly before 13:00 BST. It was adorned with a painted picture of Geldof, her husband, their two young sons and pet dogs. Kate Moss, Sarah Ferguson, Duchess of York, and Rolling Stones bassist Bill Wyman are among the mourners, with Bono and Annie Lennox expected to join them, the Telegraph reports. The cause of death remains unknown.